You must be at least 18 years old, or the minimum age required to purchase or use Alcohol products in your state/country of residence. Please note items from the Edradour Shop are available to UK customers only. Matured solely in a Sauternes cask. Limited Edition. 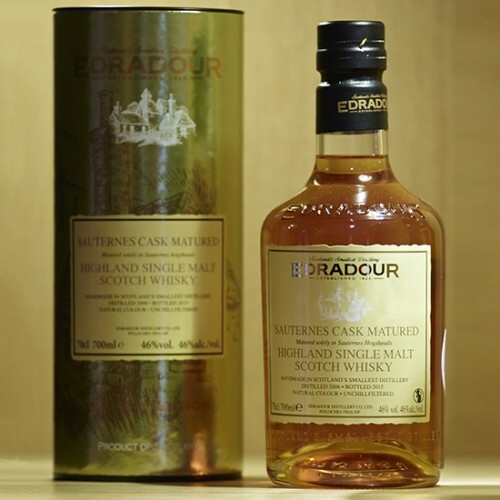 This is our latest batch of Sauternes cask matured Edradour, which follows on from our 2003 release. Our very limited output means that we are unable to fill all the wood types we would like each year and still meet the growing demand for our core range of sherry and bourbon casked malts. 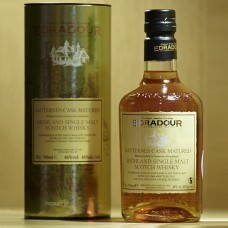 In 2006 we filled a total of 18 Sautenes casks with new Edradour spirit. During maturation in our dunnage warehouses at the distillery, we have closely monitored the development of the spirit. The casks have imparted a lovely golden hue and contributed to a delicate sweet and spicy character to the final product. The 2015 bottling was limited to 1616 x 750 ml bottles for the USA and a maximum of 2600 x 70 cl bottles. Palate: Mango, hint of pepper, raisins, honey and spices. Finish: Lingering dried apricots, fudge and more honey.